Heather H. submitted this photo and caption. I am a former member (1972-83) of the St. John's Girls Drum and Bugle Corps from Brantford, ONT, Canada. 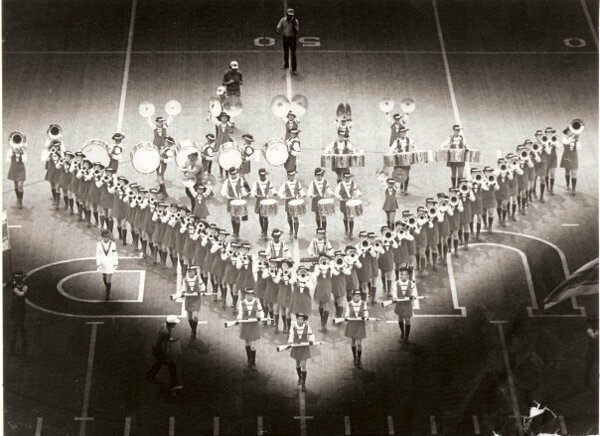 I'm sure those of us who marched in the corps and remember this picture (DCI prelims, Franklin Field, Philadelphia, 1975) will have fond memories. It was a memorable trip down to Philadelphia for our Jr. bus, in particular. Some time after crossing the border, our two busses got separated and our Jr. bus shall we say, became LOST. Our GPS system of the day-aka MAP, was non-existent and our bus driver was, not so experienced (we used to rent busses). We should have arrived at our housing between 10 and 11 p.m. the night before the Prelims. The Sr. bus made it just fine. We on the other bus, did not arrive until 11 a.m. the next morning, shortly before we were to take the field at Prelims. We were greeted by a very worried and bedraggle corps director and all of the other girls and chaperones. We were fed, very quickly and suited up as much as most of us could — I had left my freshly polished boots at home. If you look down the left side of the picture-Soprano line, first person to the right of the 45 yd line, the feet are a slightly darker, matte black. Just socks and black tape. Did you know Astroturf was really prickly back then, sort of like velcro? And hot. Thankfully, DCI had changed our field time to a 1 p.m. start, due to the circumstances. We went out and did our best. We just missed making Finals, but it was a memorable trip anyway.